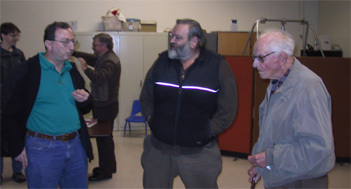 In this photo are three SJAA stalwarts. On the left is Bob Fingerhut, a former SJAA president, vice-president and treasurer. In the center is Jack Zeiders. He invented the beginner's all-purpose astronomy class. He is also a former president and a former editor of the Ephemeris. 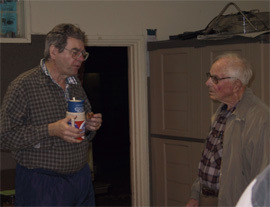 On the right is the oldest member of the club, John Delaney, who has been a member continuously. He is one of the seven who signed the articles of incorporation in 1955. John says that he's probably held each of the SJAA offices. The participants in the White Elephant exchange gather around hoping to get a nice present. All the while they know what a loser gift they submitted. 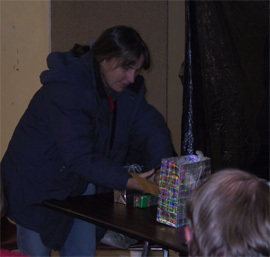 The exchange is a standard feature of the December general meeting at SJAA. Jim Van Nuland and John Delaney discuss the earliest days of the San Jose Astronomical Association. There's a lot of institutional memory depicted in this photograph. One of our illustrious regular columnists, Akkana Peck, demonstrates the Shallow Sky method (rattle testing?) for determining the best available "gift" during the traditional White Elephant gift exchange at the December meeting. On December 18, 2004, the SJAA celebrated its 50th anniversary. 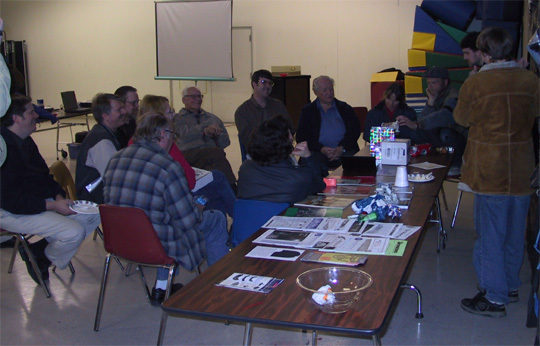 Several of the long time club members were present and talked about the (good and otherwise) old days. Mike Koop gave a presentation that served to highlight the different eras and create a bridge from one decade to another. The meeting was recorded and it may soon be available as a DVD. The meeting was also the traditional holiday general meeting which meant there was a lot to eat and a white elephant gift exchange was held. A special treat was a CD of the SJAA Ephemeris Archive - 50 years of this publication (although the name Ephemeris came later). Mike Koop says that there will be further articles on the history of the SJAA. The pictures will hopefully tell the story in more detail. All photos in this issue are by Paul Kohlmiller unless otherwise noted.